By Charles Dickens. Adapted by Lyttelton Arts Factory. Directed by Mike Friend. Following an acclaimed inaugural season in December 2015 at the East Riding Theatre in the UK, LAF's Artistic Director Mike Friend directs Adrian Rawlins' original adaptation of Dickens' dark tale of social injustice seen through the eyes of an innocent child. In a highly visual interpretation incorporating song and dance, LAF's Oliver Twist captures the essence of Dickens' colourful landscape in a tale that still resonates today. Director Mike Friend puts his fresh and exciting mark on this well-loved story of the orphan boy Oliver on his fateful journey from destitution to salvation via the colourful, and often dangerous, characters he meets on the way. "More please! 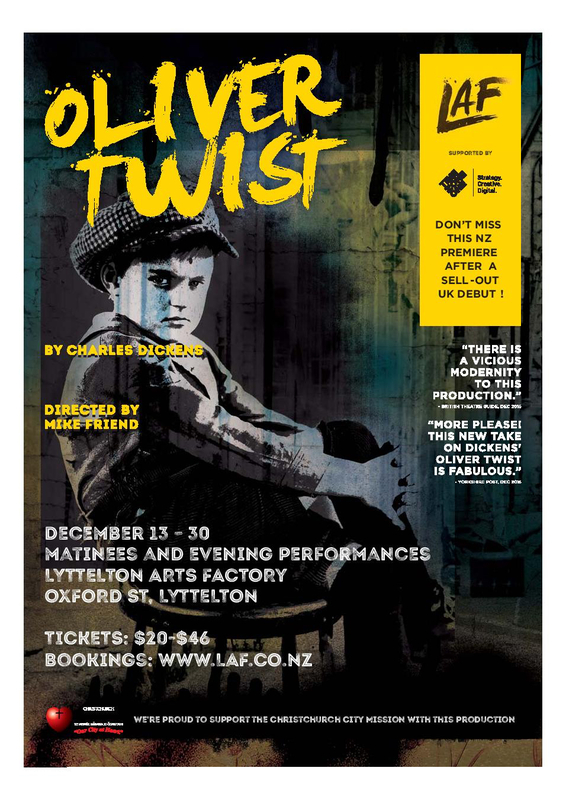 … this new take on Charles Dickens’ Oliver Twist is fabulous.” We’re proud to support The Christchurch City Mission with this production.